I've recently finished a piece inspired by the Celestial collection this week, and I'm proud to say that 'Luna' is currently on display in my home gallery collection for now. 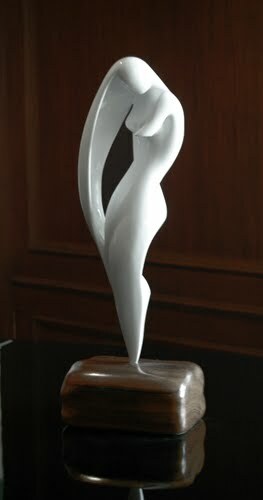 Like most of my eve works, she is handcast in marble with a pure titanium white lacquer and gloss. Her stature sits on a natural Narra wood base, carved into a secondary focus point. Luna is one of my favorite single pieces to date, because she carries a fluid contour that is very similar to the very first Celestial piece, however I've highlighted her subject to a more arched disposition than the previous. In the coming month, or maybe the next, she will be displayed at the Artasia Gallery in SM Megamall for public exhibition with the sculpture show. There's a slight chance you may catch her at the national Manilart' Festival at the end of July as well. If so, we'll be showing at the Artasia Gallery Booth on the festival dates. Inspired by the arch of a crescent moon, this intrepid work is an tribute to the natural design of God. I shaped it with a dual viewpoint in mind, creating a sideways fluidity into the piece as well. Her semi-oblong length is a piercing space to the surrounding air, while the Narra wood base confines her leap into a single height of motion. The use of white and natural wood creates a combination I've been beginning to use in many of my more recent works. The contemporary visual relation of the two distinctly opposite patterns gives rise to a favored effect on the sculpture in natural light. Luna is one of my featured works for the month of July.